Instantaneous online ranking system. See your overall position as you play! Compete with other players in a Massively Multiplayer Online game. Control your own city and manage your empire which changes over time. 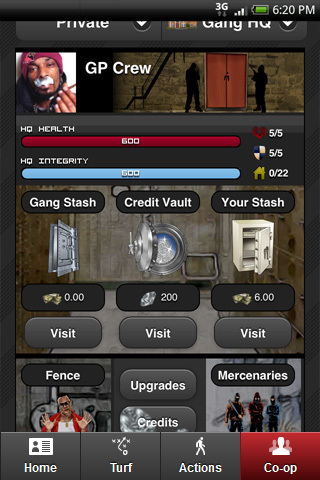 Employ dealers and build an army of gangsters. Wage war with other players. Take their money or hit them where it hurts. Think big. Use your map placement, income, location effects, perks, timing, attacks, defense and other strategic elements to your advantage. 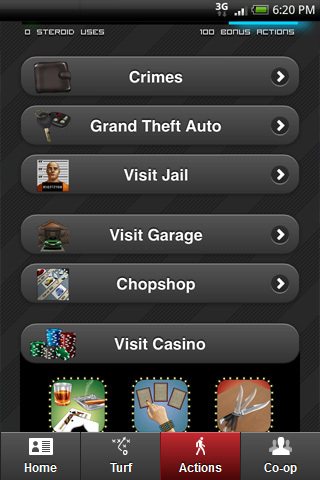 Commit crimes, grand theft autos and jailbreaks along with your gangsters. Get involved in the community with chat, forums and messaging. Create and customize your own profile. Build yourself a reputation. Gamble in the casino with mini-games like BlackJack and Spin the Shank. Q. When is the game out? A. We're aiming for an early Autumn release - end of September ideally. If we need to take longer we will as we want to release a fun and complete game free of any technical issues. Check back here every now and again for updates. A. 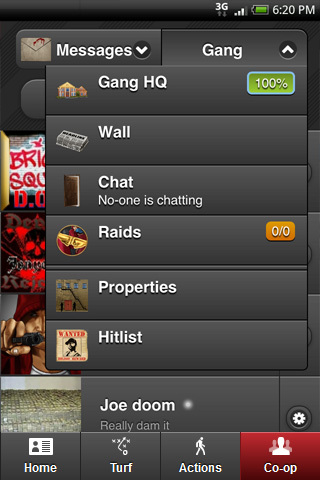 We're just calling it Gangster Paradise App for now. A. 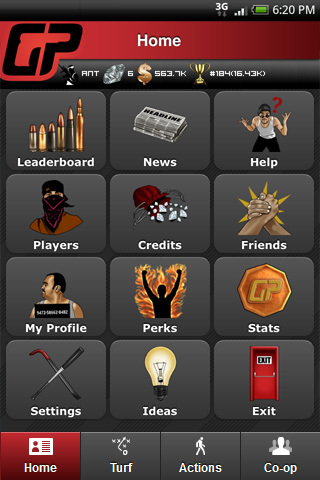 We want to make the perfect community-orientated gangster game across a wide variety of devices. It's a fairly large game and takes time considering the range of technologies and systems involved. A. Nothing! The app will be free to download and play. Credits will be available to help you in the game through in-app purchases, but we've worked hard to make sure these don't give you too much of an advantage over others. Those who put the time in and use strategy to their advantage will come out on top regardless of credit usage. Q. What device do I need to play on the app? A. Any Apple iOS device such as iPhone, iPod touch, iPad, any Android device such as a samsung/htc/etc or any Blackberry 6+ smartphone/tablet. Q. Will the game have X feature? A. The GP App will have a number of unique features not seen in the other games. We're not giving specifics. There's a system where you can suggest new features and changes, or vote for others within the game. Q. Can I login using my GP1 / GP2 account? A. No, the app is a new game with different gameplay and ranking to the others. Q. What will happen to GP1 & GP2? A. Development will continue on both where required, we have a bigger team now and are keen to drive all the games forward together after a somewhat dry spell. Q. Why not just adapt GP1 & GP2 for mobile? A. We wanted to create a great new mobile experience without being restricted to what had been done in the past. Those two games are brilliant for desktop use, but rather complex and overwhelming to new players and this would be even worse on mobile devices. Q. Won't this just split up the GP community even further? A. There are plans to unite all three games through optional common forums, chat rooms and more open player profiles. Further segregation is the last thing we want and we hope the new game will help bring players to the more mature and feature rich desktop games. Of course, you are free to continue playing 2 or all 3 of the games at the same time and as this app is a little different to the others we suspect people will do so. Q. How will cheats be dealt with on the new game? A. Considerable time has been put into making sure this is the fairest game we've made yet. Cheating is always a problem in RPG games such as this, but we've added systems and gameplay mechanics which should make cheating rather pointless. 29th May 14 - GP V5 Released!